On Wednesday, February 22 I was fortunate enough to attend the 2012 Service Awards and Appreciation Luncheon. Since this is my first year at Gladney, this was my first time to attend. The luncheon was an amazing experience, and not just because it was catered by Joe T's. :) The day started with recognition of the fabulous Gladney volunteers. 26 men and women were recognized, myself included. After the volunteers, Tanya Houk presented the Transitional Care Parents. All of these families have the biggest hearts and are essential to the service that Gladney provides. Peggy Jones is a Transitional Care Parent who was honored for her 5+ years of service. She got behind the podium and told the room what being a Transitional Care Parent meant to her and how much she loves Gladney. Following Peggy's moving speech, Frank Garrott began presenting the Service Awards for the Gladney Employees. 6 people were honored for 5 years of service, 3 for 15 years of service and 1 for 20 years of service. All 10 of these employees have impacted many peoples lives and dedicated their time and energy to making Gladney successful. 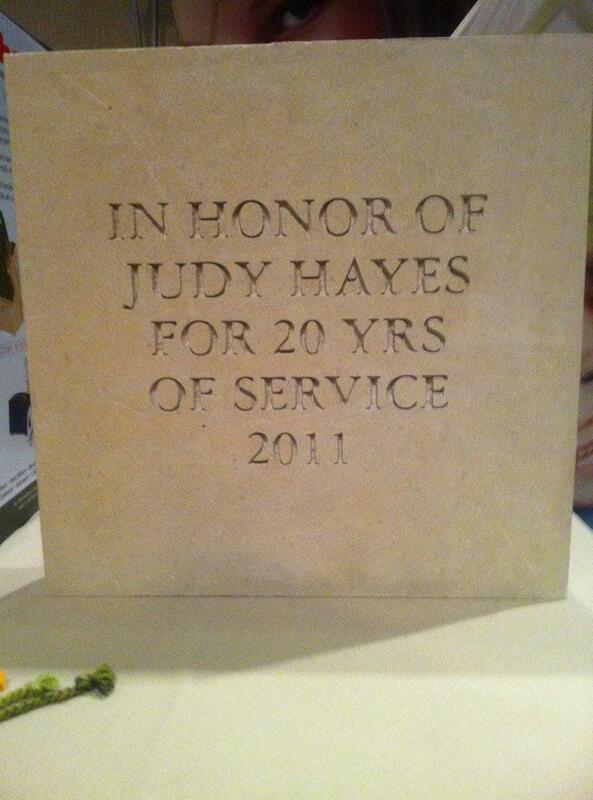 Judy Hayes was honored for her 20 years of service - You rock Judy! !